Try these sweet potato fries from Strength and Sunshine for a new twist on sweet potato fries! Perfect as a side or even a snack. Preheat the oven to 415ºF. Cut the end off each sweet potato before spiralizing. Snip the long strings with a scissor to desired length. Place the sweet potato strings in a large bowl, add in spices (desired amounts), and toss to coat the strings. minutes, careful not to burn. Try this recipe from Paleo Grubs for a healthy twist on this classic dish! Note: You can buy tartar sauce, or use this recipe to make your own. Preheat oven to 425 F.
Line a baking sheet with parchment paper. Place the sweet potato fries on prepared baking sheet, drizzle with 2 tablespoon of oil and sprinkle with salt. Toss well to coat. Arrange the fries in a single layer and bake in preheated oven for 15 minutes, then stir to cook on the other side. Cook for 10 minutes more. Meanwhile, prepare the fish. In a plate mix 2 tablespoons of sesame seed flour, 1 tablespoon of arrowroot flour and pinch of salt. Mix well to combine. Cut the fish fillets into 5 inch long pieces and pat them dry well with paper towels. Season with salt and set aside. To make the batter, in a shallow bowl add the egg, remaining sesame seeds and arrowroot flour, baking powder, small pinch of salt and sparkling water. Mix well to combine. Press each fish fillet into the arrowroot-sesame seed flour mixture and shake off the excess, then dip each one in the batter. Pour oil to depth of 1/2 inch in a large skillet and heat it over medium-high heat just until it’s nearly at the smoking point. Fry the fillets, in batches, 2 minutes per side or until golden brown. Remove cooked fillets from pan and place them on paper towels to drain. 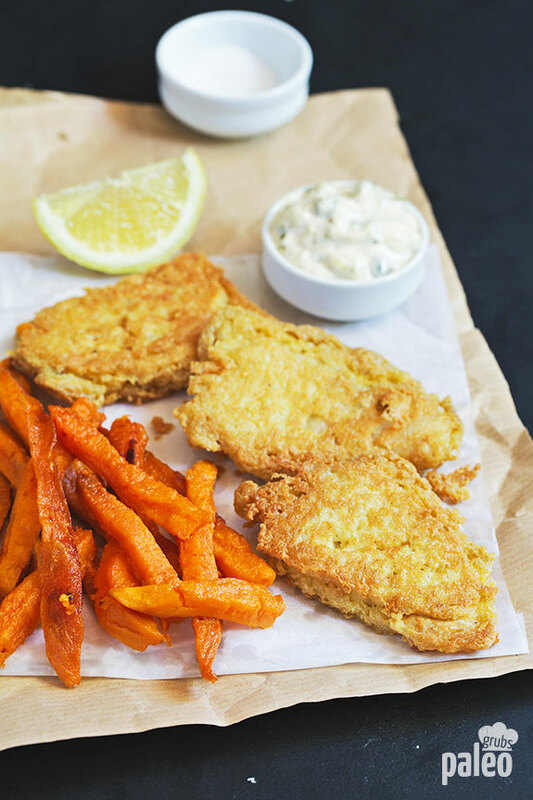 Serve with sweet potato fries, lemon veggies and tartar sauce.